The University of Wisconsin System Board of Regents Administrative Hiring Workgroup recently released draft documents relating to their work on streamlining the hiring process for the System President and UW institution Chancellors (below). The Regents are expected to review these documents at their meeting October 5 and 6 at UW-Stout. Regent President John Behling created the workgroup earlier this summer to examine the hiring of of non-traditional President and Chancellor candidates and to streamline the hiring processes of those positions. Regent Drew Petersen chaired the committee, which did not include a representative from UW-Madison. An ad hoc committee of UW-Madison faculty is working to respond to the recommendations. Faculty are also encouraged to share their thoughts on the Administrative Hiring Workgroup webpage. The Legislative Fiscal Bureau released a summary of AB 64, the 2017-19 biennial budget, along with individual agency summaries, including UW System (below). These documents reflect the Governor’s original proposal and changes made by the Joint Finance Committee. Both houses of the legislature must pass the bill, which will be taken up by the Assembly tomorrow, Wednesday, September 13. Governor Walker said last week he hopes to sign the bill later this month. The Legislature’s Joint Committee on Finance concluded its work on the 2017-19 state budget last night with the adoption along party lines of a “wrap-up” motion that included several non-fiscal policy items relating to the University of Wisconsin System (highlighted below, pages 2, 8, 9). 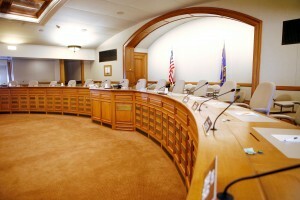 The committee restored language originally proposed by the governor in February. Each UW institution will be required to create a policy that monitors faculty and instructional academic staff teaching loads. Each institution will also be required to develop a policy for rewarding faculty and instructional staff who exceed standard workloads. Aggregate data must be published on UW System’s online accountability dashboard and included in legislatively mandated accountability reports. The committee modified previously adopted language relating to the hiring of university leadership positions. The new language prohibits individual campuses from adopting a policy that requires the Board of Regents to only consider candidates who hold tenure or a terminal degree in their field. The committee had previously applied that prohibition to the Board of Regents. UW-Madison Faculty Policies and Procedures (FP&P) currently requires the Chancellor and Provost to hold a tenured faculty position. Earlier in the budget process, PROFS asked the co-chairs of the finance committee to remove the proposed language. A Regent working group is currently reviewing the hiring process and expects to release their recommendations later this fall. PROFS is carefully monitoring the group’s work. The motion also changes the dates for the proposed 2 percent pay plan for all state employees, including UW faculty and staff, from September 30, 2018 and May 26, 2019 to July 1, 2018 and January 1, 2019. The pay plan must also be approved by the Joint Committee on Employment Relations. Progress on the state’s 2017-19 biennial budget is picking up as the Joint Committee on Finance is scheduled to meet today (Tuesday, September 5) to vote on the state’s transportation budget. Until a new budget passed, the state continues to spend according to the 2015-17 budget. Since the budget was introduced in February, PROFS has been busy meeting with legislative leaders and lobbying for the best possible outcome for University of Wisconsin-Madison faculty. Extension of the current four-year tuition freeze for two additional years. $26.3 million in outcomes-based funding. Regents will create metrics to measure progress toward goals. $5 million for high-demand degree programs. 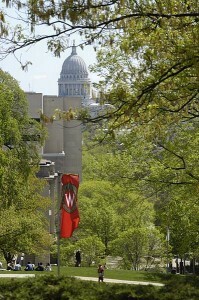 $3 million for the creation of the Tommy G. Thompson Center on Public Leadership at UW-Madison. $10,000 for the review of policies related to academic freedom. $980,000 for UW Hospital and Clinics Carbone Cancer Center. $200,000 for the Rural Physician Residency Assistance Program. $100,000 for UW-Madison’s Alzheimer’s Disease Research Center. Creation of an engineering school at UW-Green Bay. Language that bars the Board of Regents from adopting a policy that would require UW campus chancellors and vice chancellors and the UW System President to have tenure or hold a terminal degree in their field. Expansion of tuition free-education programs for veterans and their families. PROFS has deep concerns about policy items in the budget and has asked the co-chairs of the finance committee to remove language relating to the qualifications for UW System President and Chancellor candidates and amend the language that creates the Thompson Center on Public Leadership to eliminate the leadership board, allow for the creation of an advisory committee, and ensure, as is the case for all other UW-Madison centers, that the Thompson Center is subject to university governance. UW System Board of Regents President John Behling named members of the workgroup tasked with review of UW System Chancellor and other top administrative positions (see above). The group, which does not include a member from UW-Madison, will examine hiring practices and consider expanding the search process to include non-traditional candidates from outside academia. Behling told fellow Regents last month he would like UW System institutions to recruit non-academic candidates and “streamline” the hiring process for top administrative positions. UW-Madison Faculty Polices and Procedures (FP&P) requires the Chancellor and Provost to hold a tenured faculty position. PROFS met with Regent Drew Petersen, chair of the workgroup, to share UW-Madison faculty concerns. Peterson told PROFS it is too late to add a UW-Madison faculty member to the workgroup but he welcomes input from an ad hoc UW-Madison committee and will work with PROFS on strategy related to working with legislators and the governor on this topic. This bill, which passed the Assembly Colleges and Universities Committee on a partisan vote, requires the Board of Regents to adopt a policy on free expression for all campuses. Under this bill, university administrators would be required to punish students who disrupt campus speakers. The bill would also require campuses to remain neutral on public policy issues. PROFS is registered in opposition to the legislation. Our statement on the bill is here. Supporters of campus carry have said they intend to introduce legislation allowing concealed weapons on campus, but nothing has been introduced to date. PROFS is opposed to campus carry and continues to carefully monitor the issue. Republicans who control the legislature appear to be split on legislation relating to the use of fetal tissue in scientific research. Two different bills have been introduced, one that follows existing federal law forbidding the sale of fetal tissue, but not research that uses it, and one that bans research using fetal tissue from abortions performed after January 1, 2017 and imposes hefty fines on anyone who uses the material. PROFS has assembled a working group comprised of faculty and industry representatives to advise us on this issue. In July, Taiwanese manufacturer Foxconn and Governor Scott Walker announced Foxconn’s intention to build a liquid crystal display manufacturing plant in Wisconsin. Wisconsin would provide $3 billion in state incentives over 15 years to Foxconn. The plant could ultimately provide 13,000 Foxconn jobs and thousands of related jobs. Legislation authorizing a financial package passed the State Assembly August 17 and a State Senate vote is expected soon. Prior to the announcement, Chancellor Rebecca Blank met with leaders of Foxconn to discuss the advantages of locating such a facility near a major research institution like UW-Madison. Her statement on Foxconn is here.